I've made several websites of my family's kind of events, like trips, school activities, someone's birthday and so on. Some of them are linked to this weblog. I'm going to translate them. One of them, the record of a trip to the Canadian Rockies has almost been translated. Please look at it. There are lots of photo albums, video tapes and photos of my kids in my house. I couldn't have thrown away the school work of my daughters. Many paintings, wooden or clay works, letters to me or to my wife expressing gratitude, old notebooks in which poor and cute letters are written. All of them are kind of the treasure of my family. However, to my regret, there isn't enough space for them. I selected extremely important items and I'm storing the rest on DVDs to save space. Of course some of them were stored as pictures. These DVDs would be gifts from me and my wife when my daughters get married. I'm going to enjoy skiing in Whistler in Canada this spring. I prepared new skis for me and my kids, a new video camera, and a walkie-talkie and so on. Besides, I sometimes check the website of the Japanese Ministry of Foreign Affairs to see security information about Canada. I'm glad to see that Canada is a secure country. Today's online news on my PC display says that terrorist attacks again occured in Iraq. I strongly feel I'm lucky to have been born in Japan. By the way, I almost forgot to determine if my passport was valid. I checked it yesterday and knew the expiry date was Feb.29th this year. I was so surprised to see it. 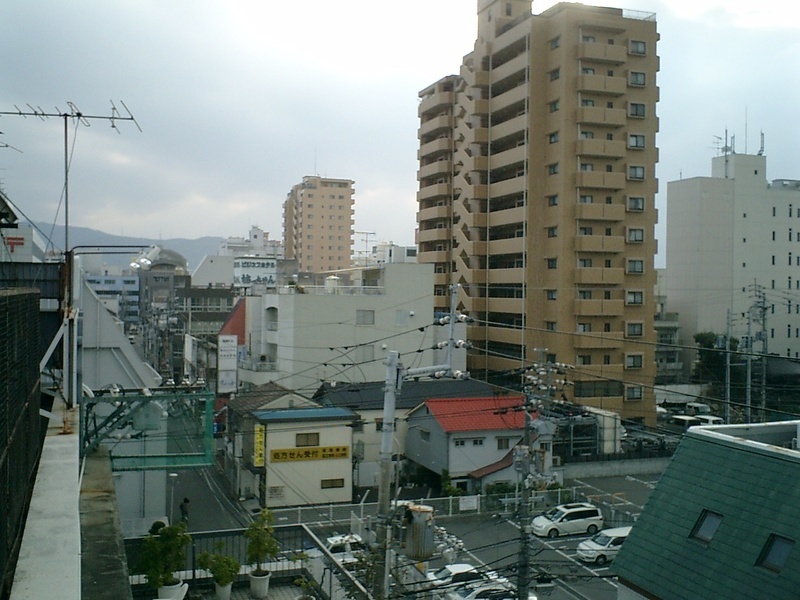 I was lucky again to find out before leaving Matsuyama. I immediately applied for passports for me and my kids. My father-in-law fell down and broke his left humerus and was admitted to a hospital. He lives alone, 5 hours away from here. I and my wife visited his hospital today. He didn't look so bad. It was heart-warming. He has two sons. Both of them want and are persuading him to live with them, but he doesn't want to. He seems to want to keep them at a distance. I don't know what to do. However, the situation is not so optimistic. I have to find a useful tactic. The other day my eldest daughter Eri started driving school. She doesn't have good reflexes. This morning the topic during breakfast was who will be the first to sit in her front passenger seat. I said, "in the US the front passenger seat is called the death seat or suicide seat because the mortality rate of the person on that seat is higher than that of people in the other seats." Nobody applied. Anyway she seems to be happy to learn how to drive a car. In recent years yoga has really boomed in Japan. Besides, the number of TV programs that handle the issues of health are increasing. In every program, they say that some foods, some exercise, some ways of life, and some habits are good for health. Some of them often show how to do yoga. They say doing yoga has the effect of reducing weight and keeping fit. By the way, watching such TV programs, my daughter started doing yoga. She is doing yoga every morning and night for 5 minutes. It seems like kind of warm-up exercises. People who do yoga display flexibility in their body. I sometimes thought that their flexibility might be a kind of disease as their bodies were unbelievablely flexible. I've been thinking yoga was a kind of religion because I saw some religious Indians doing crazy yoga. I don't like yoga because my body is like a lead pipe, or barrel. However, because my daughter strongly advised me to do yoga, now I'm doing yoga to reduce my weight for skiing in Canada. You can never tell what might happen or might not happen. I know there are many ways to celebrate Valentine's Day in the world. In Japan women usually give chocolates to the men they like. However, in many offices, female staff members sometimes give obligatory chocolates to their male co-workers. It has been a custom in Japanese offices. My hospital is like that. I received some chocolates out of a sense of social obligation. I wonder what should I do in return? I'm planning to have a long motorbike ride next summer. A friend of mine, who is a computer programmar, is going with me. We sometimes got together and went touring by motorbike. This time, the destination is Aomori Prefecture, which is in the north of Japan, and a little south of Hokkaido. We will bring all the necessities; tent, clothes, cooking tools, maps, PCs for internet access, walkie-talkies etc. We are exchanging e-mails for the preparations and enjoying the preparation itself. Today is a national holiday. A kind of Independence Day. An Independence Day is an annual celebration commemorating the anniversary of a nation's assumption of independent statehood, usually after ceasing to be a colony or part of another state. Most countries honour their respective independence day as a national holiday. In Japan the purpose of this holiday is to commemorate the establishment of the nation and to promote love for the nation. By the way, my hospital is open today. Because most hospitals in this city are closed, my hospital is thronged with people who have something wrong with their health. 80% of the patients have a common cold with a high fever. Some of them are suffering from influenza. I gave the same explanations to the patients again and again and am dead tired. 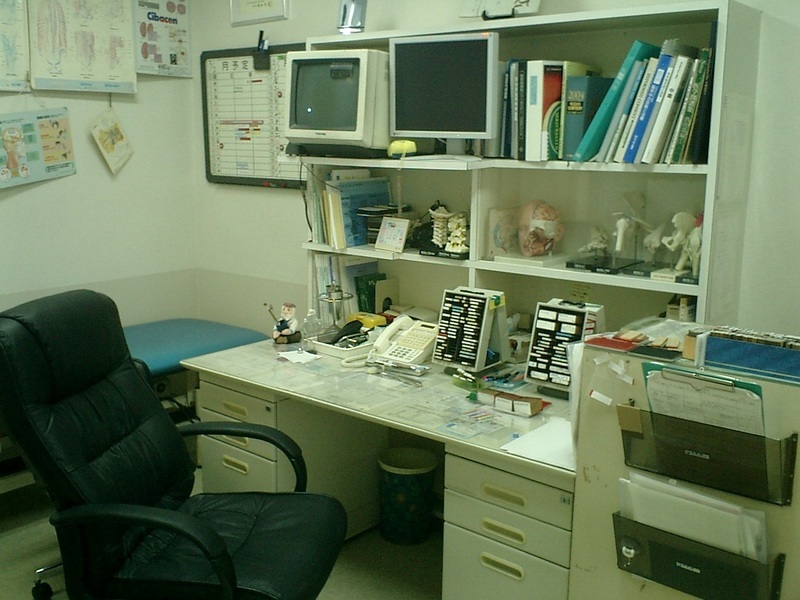 The photo shows the consultation room of OPD. Two displays were for the CT scan and the MRI. You can check the live images of the CT scan or the MRI here. Several models of skeletons, spines, and brains are on the shelf. The stamps are for writing the diagnosis or lots of procedures on the patients' charts. You know, Japanese letters are complicated. When I write rapidly, you can sometimes hardly read it properly. Besides, it takes time to write Japanese letters, so we often use alphabets. It's the reason we often use stamps for the charts. The schedule board is on the wall. Illustrations for explanations to the patients are hanging on the left wall. I usually spend 4 hours a day here. I attended a medical briefing. Today's briefing was about Chinese herbal remedies. I learned nothing about oriental medicine at medical school. They were apt to underrate oriental medicine 20 years ago. I was thinking those days that Chinese herbal medicine would be prescribed by the dropout doctors. However, Chinese herbal medicines have become popular in Japan. I have to learn how to use them. I'm watching CNN now. It is reporting the story about the cartoon of Mohammed repeatedly. A phrase came up in my mind watching the news. So many men, so many opinions. However, they have no right to harm anybody for any reason. To express my opinion to the world is one of the reasons for me starting to write a weblog in English. Though I have many opinions about many things in the world, I don't have enough ability to express them in English properly now. I need to learn more and more. It's raining and very cold today. On such a day, the number of OPD patients is usually small. All the staff members except for the boss are relaxed enough to flick through the shopping catalogue. I like this atmosphere. I spend the time cleaning up my room. The photo shows the view from the roof of my hospital. My hospital is located in the center of the city. I live in the outskirts of the town and commute by compact car. I sometimes go downtown after getting off work. At that time I leave my car in the parking lot overnight. This location is ideal for hitting the town.